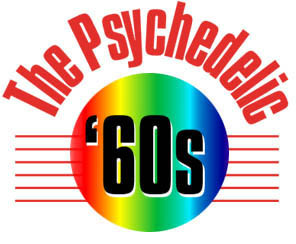 WHEN ONE CONSIDERS the "Psychedelic Sixties," San Francisco most often comes to mind, but New York also had a highly active and influential artistic psychedelic scene. 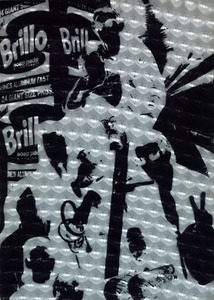 Andy Warhol and his cohorts at his famous Factory were defining and creating "Pop Art," breaking down barriers between art and everyday life, at the same time Bob Dylan was forging blues, country, folk, and rock music with a poetic sensibility that would influence most forms of popular music in the coming decade. Ed Sanders pushed every known limit with his obscenely-named underground press, his similarly-titled magazine, and his musical group, the Fugs, and he, along with countless other former Beats, easily moved into the evolving hippie scene. Although the urban grittiness of New York was not conducive to a Love-In or an Acid Test on the beach, there were marches, demonstrations, underground newspapers, and alternative musical groups that provided a grounding intelligence that countered the often superficial and fanciful idealism of the San Francisco experiment. Andy Warhol. Andy Warhol's Index Book. NO ASSESSMENT OF the sixties would be complete without a look at Andy Warhol: artist, author, filmmaker, rock music producer, and celebrity. Warhol took the Pop Art sensibilities to its furthest extremes, single handedly breaking down the barriers between commercial and serious art. With his work in mass-produced art, documentary style movies, his defining of celebrity as an art form, and the drug- induced, fully documented, orgiastic parties he threw in his famed Factory, Andy Warhol became a major influence on the aesthetics of the decade. Andy Warhol's Index Book is a compilation of interviews, art inserts, pop-ups, photographs, recording discs, and descriptions of life at the Factory. 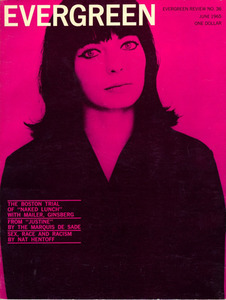 In June 1968, Valarie Solanis, a minor "superstar" from the Factory, shot Warhol in the chest and abdomen for his refusal to produce a screenplay she had written. Though he survived the attack, he was never able to continue the extremist activities he so boldly embraced. Andy Warhol and Gerard Malanga. Screen Tests/A Diary. 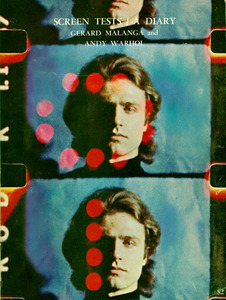 THIS BOOK REPRODUCES frames from various screen tests for Warhol, accompanied by a short poem on the featured subject. Included are such luminaries as Lou Reed, Salvador Dali, Edie Sedgewick, Nico, and, of course, Allen Ginsberg. BOB DYLAN WAS a folk singer of protest songs in the early sixties, but after beginning his friendship with Allen Ginsberg in 1964, Dylan began fusing blues, country, folk, and rock sensibilities, and releasing albums that were lyrically rich with mystical, apocalyptic imagery. At the time of Tarantula's conception, Bob Dylan was at the height of his artistic powers, releasing three of his best albums, Bringing it All Back Home, Highway 61 Revisited, and Blonde on Blonde, (a double album), in the space of sixteen months. He was by then the most influential, critically acclaimed artist of his generation and much of the philosophical and artistic outpouring of the sixties can be traced to his influence. 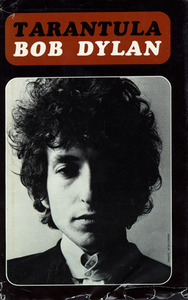 Still, without the music to shape the words, Tarantula was neither an artistic nor commercial success, and though written in 1965, Dylan put off its publication for several years. Ed Sanders. 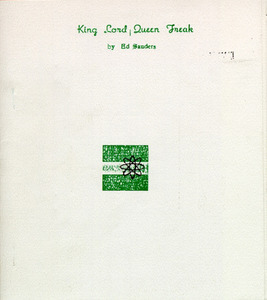 King Lord Queen Freak. THE WORK OF Ed Sanders also bridged the Beat movement and the hippie era that followed. He moved to New York from his hometown of Kansas City in the late 1950's, and became enthralled by the burgeoning Beat scene. In 1961 he started an underground press which challenged the limits of censorship with its unprintable name and the publication of otherwise unpublishable poems by such artists as Ginsberg, Burroughs, Kerouac, Corso, and Creeley. In 1964, he opened the Peace Eye Bookstore on the Lower East Side, a shop that was often raided, resulting in Sanders' frequent arrest. He also cofounded the satirical folk/rock group, The Fugs, a group that made every attempt to be offensive. Sanders published several novels, numerous books of poetry, songbooks, broadsides and record albums. Barney Rosset, ed. Evergreen Review. New York: Evergreen Review, Inc., 1962. IN THE EARLY 1950s, Barney Rosset bought the failing Grove Press and began his lifelong battle against censorship in America. Over the next decade he published such banned books as D.H. Lawrence's Lady Chatterley's Lover, and William Burrough's Naked Lunch. With the publication of Henry Miller's Tropic of Cancer in 1962, Rosset successfully fought the legal battles that eventually led to the end of censorship for literary works in this country. In 1957 Rosset began publishing the Evergreen Review, a quarterly serial publication that featured counterculture writers such as Ginsberg, Kerouac, and Burroughs, as well as continental writers not well known to the American public such as Samuel Beckett, Jean Genet, and Blaise Cendrars. Grove Press and the Evergreen Review paved the legal way for much of the artistic expression that up to this time would have been subject to censorship by the U.S. Customs Department. New York: Evergreen Review, Inc., 1965. 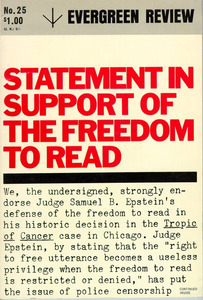 Shown are issues from July-August, 1962, featuring an article about Judge Samuel B. Epstein's decision to allow the publication of Tropic of Cancer and the June 1965 issue that reports on the Boston trial of Naked Lunch. New York: The East Village Other Inc., 1966. ONE OF THE more successful underground newspapers to come out of the New York scene in the sixties. 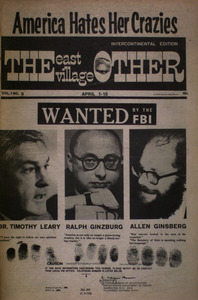 Shown is an issue from April 1966, with wanted posters for Timothy Leary, Ralph Ginzburg, and Allen Ginsberg.